A recent trip to New Mexico coincided with my sister’s birthday. It’s been a few years since her passing and her kids were really young at the time. I wonder sometimes how well they remember her. My brother-in-law’s new wife does a remarkable job of finding ways to help the kids remember a woman she never knew. I got a group message from her that morning as we were heading out the door for a day of exploring. She requested stories of my sister that she could pass on to the kids throughout the day. We were visiting my husband’s family, and I didn’t want to be a downer for the fun we were anticipating. So I didn’t mention what the significance of the day was to them. But I followed my phone obsessively while we drove and the stories started coming in. My in-laws took us to the Gila Cliff Dwellings. I’m a sucker for ancient ruins. I will hike out of my way in the blazing desert heat, which always seems to be the circumstances for these things, at the mention of ruins. Bonus points for pictographs. I was expecting caves with worn spots in the ground and maybe some pieces of pottery. That alone would be pretty neat and well worth the hike in my opinion. But what we saw far surpassed my expectations. The trail led right up to actual homes built into the side of the rock. Walls of rock and mortar sectioned the cliffs into individual rooms. I ducked through doors and peered through windows. My oldest and I were discussing what a job it would be to take care of children on these cliffs when I looked up on the ceiling of one room. To my delight, I spied the red form of a pictograph, the figure of a person if my limited pictograph knowledge was right. The park ranger overhead my excitement as I pointed it out to my son. “There’s another one over here,” she said, her long frame easily leaning out past the rock wall barrier to show us how to find it. We each took turns leaning cautiously to see the pictograph on a wall inaccessible to us. Sure enough, the red markings were unmistakable. The trail wasn’t long, maybe a quarter of a mile, so the reward was almost immediate. The rock wall was covered in red markings. Some of the markings were too faint to make out, but others were quite identifiable. I tried to play it cool while I snapped way too many pictures of pictographs whose meaning I didn’t fully understand. I love storytelling in all its forms. I love that it’s always been a part of humankind’s history. Even if I don’t know the story, I love the remnants left behind. Did the same person make all the images? What was so important about this story to earn a place on the rock wall for others to see? 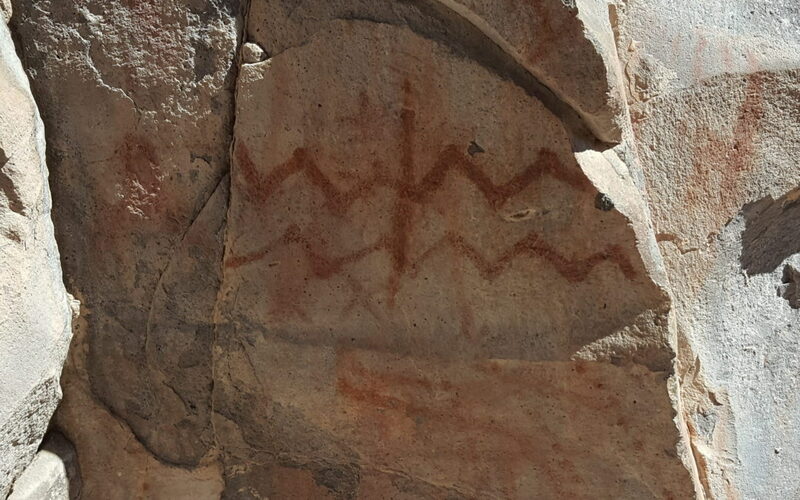 I think part of me thrills at the pictographs and ruins because someone’s story survived. Not the whole thing. I don’t think you can ever capture the entire story. But at the core of it all is something that really resonates with me. To have a piece of your heart and soul withstand harsh conditions for hundreds of years, who wouldn’t marvel over that? Even hope for it? We pulled away from the campground happy and satisfied at the day’s discoveries. Several consecutive dings announced that we’d hit cell phone coverage. Memories and stories of my sister flooded my feed. I chuckled at one of the messages and my family in the car demanded to know what was so funny. I read to them the recollections that so embodied my sister, laughing as I filled in gaps and added details. I had to censor each story carefully to make certain I could read it out loud without crying. As we cruised down the isolated highway my own memories flew from my thumbs onto my screen. Small traces that she lived. Yes, oh yes, she lived. Beautiful. I love cliff dwellings, too. Never forget how I felt when Pat and I were at Mesa Verde. I love this piece, Crystal. Memories are like a warm cozy quilt. I am happy Cami’s children have a stepmom who loves them enough to keep Cami’s love and memory alive for them.